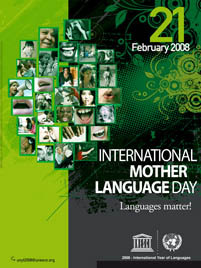 Today is the ninth annual International Mother Language Day (IMLD), and the date of the official launch of the International Year of Languages (IYL). UNESCO also has a portal page for more info in IYL. I’ve posted various information about IMLD and IYL in a special section of this site on Support for IYL 2008. It includes links to pages relating to IYL and IMLD on the UNESCO site, as well as a lot of other items and links. The IYL offers the opportunity to make the case for various initiatives on language and linguistic diversity. One of the things I’m hoping for is progress towards a more effective “civil society” network linking organizations and initiatives with diverse but complementary purposes. More on that later. Justification for observing International Mother Language Day is rooted in the heart of civilization that we want to renew and diversity we want to celebrate. Our identity, our languages and our cultural identities are more than basic human needs. Let’s be mindful about who we are when we join our unjust culturally diverse world. Also, to empower ourselves we must learn about our cultural rights and responsibilities. The UNESCO Universal Declaration on Cultural Diversity was adopted unanimously at the 31st UNESCO General Conference. It aims to have a significant impact on humanising globalization and making it more culturally sensitive. It was an opportunity for States to reaffirm their conviction that inter-cultural dialogue is the best guarantee of peace and to reject the theory of the inevitable clash of cultures and civilizations. 5 — Safeguarding the linguistic heritage of humanity and giving support to expression, creation and dissemination in the greatest possible number of languages. 6 — Encouraging linguistic diversity – while respecting the mother tongue – at all levels of education, wherever possible, and fostering the learning of several languages from the earliest age. 7 — Promoting through education an awareness of the positive value of cultural diversity and improving to this end both curriculum design and teacher education). Hi Matiul, Thanks for this information on the relationship of declarations on cultural diversity and human rights to International Mother Language Day (IMLD). It is certainly food for thought as we approach the 2009 observation of IMLD, which will also close the International Year of Languages.